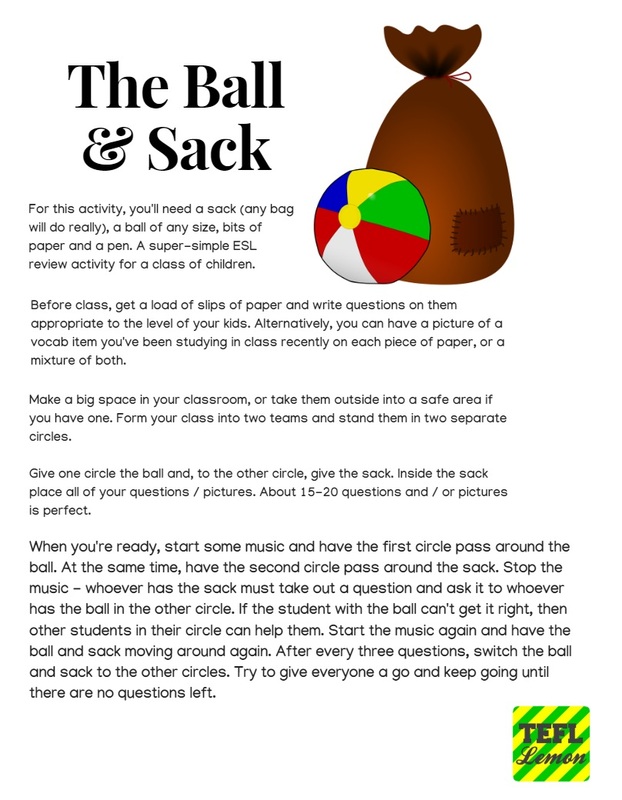 For this English teaching activity for children, you'll need a sack (any bag will do really), a ball of any size, bits of paper and a pen. A super-simple ESL review activity for a class of children. We have our entire collection of ESL Games for Kids available in full-size and colour. Go to our Books section to purchase! Before class, get a load of slips of paper and write English questions on them appropriate to the level of your kids. Alternatively, you can have a picture of a vocab item you've been studying in class recently on each piece of paper, or a mixture of both. Make a big space in your classroom, or take your children outside into a safe area if you have one. Form your ESL class into two teams and stand them in two separate circles. Give one circle the ball and, to the other circle, give the sack. Inside the sack place all of your questions / pictures. About 15-20 questions and / or pictures is perfect. When you're ready, start some music and have the first circle pass around the ball. At the same time, have the second circle pass around the sack. 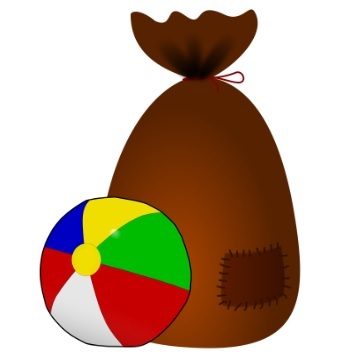 Whoever has the sack must take out a question and ask it to whoever has the ball in the other circle. If the student with the ball can't get it right, then other students in their circle can help them. Start the music again and have the ball and sack moving around again. After every three questions, switch the ball and sack to the other circles. Try to give everyone a go and keep going until there are no questions left. This is a quality ESL review activity which gets students up and out of their chairs producing language. Like this game and want to see more TEFL teaching ideas for kids? Quite often during your English teaching career, you'll find yourself teaching a unit about jobs and occupations to a class of younger learners or teens. If you're currently teaching a topic about jobs, then this ESL game for kids will fit your class perfectly. It takes about 20-25 minutes and allows your students to practice jobs and occupations vocabulary for ESL learners. This ESL activity for kids is especially for those classes where you're teaching kids how to tell the time. There's a few different ways you can put a twist on this game, but the basics remain the same. 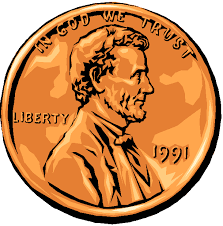 For this TEFL activity, bring in a few coins from home. On the whiteboard, draw about 20 clock faces or so with different times like below.